Morningstar announced in September 2013 it will discontinue publishing the SBBI Valuation Yearbook, but that it will continue to publish the Ibbotson SBBI Classic Yearbook. James Harrington, who was previously director of business valuation research in Morningstar’s Financial Communications Business, provides a summary of which data is being discontinued and continued, along with a discussion of alternative data sources in light of the recent announcement. 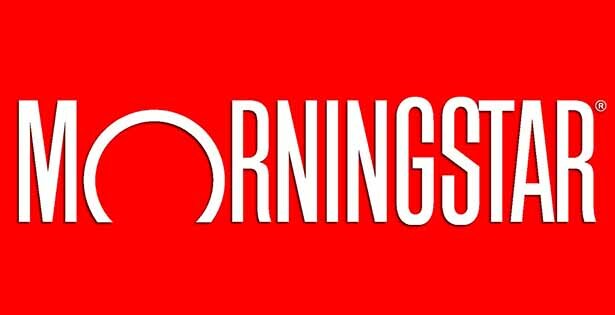 Morningstar announced in late September that it is discontinuing the Ibbotson SBBI Valuation Yearbook and other valuation publications and products. The SBBI Valuation Yearbook and other “Ibbotson” valuation products have been widely used and cited in valuation reports for nearly 15 years and were generally considered one of the essential tools needed in every practitioner’s toolbox. It is important to understand that Morningstar will no longer be updating these products after September 30, 2013. End-of-year data (December 31, 2013) will not be available for these products. I was invited to write an article summarizing these changes for readers of NACVA’s QuickRead because I originally came from Ibbotson Associates and then Morningstar [Editor’s note: Morningstar purchased Ibbotson Associates in 2006], where I was the director of business valuation research in Morningstar’s Financial Communications Business. I was heavily involved with all of the Ibbotson SBBI publications and other valuation products from 2005 to 2010, prior to joining Duff & Phelps. I am grateful for the opportunity to contribute. Morningstar announced that it will continue to publish the Ibbotson SBBI Classic Yearbook. The Classic Yearbook may not be as familiar to valuation practitioners, who generally purchase the familiar aqua-blue Valuation Yearbook. The Classic Yearbook is “the red book,” and is “a history of the returns on the capital markets in the United States from 1926 to the present” (see 2013 SBBI Classic Yearbook; Morningstar, Chicago, 2013; page 1). The Classic Yearbook has been published since 1983 (when it was the only SBBI book) and is based on a series of papers and articles written by Roger Ibbotson and Rex Sinquefield. The Classic Yearbook does not provide extensive valuation data or methodology. 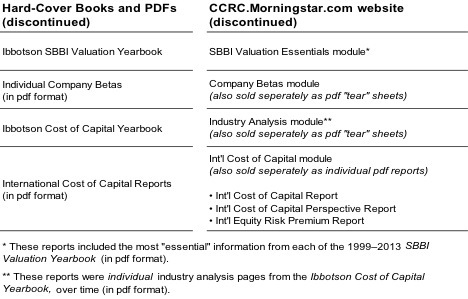 According to Morningstar, the Classic Yearbook will continue to include “some” of the content previously available in the Valuation Yearbook (as it has for years), but it is important to understand that for many practitioners, the “some” will likely not be sufficient—certain “key” variables for estimating the cost of capital found in the now-discontinued Valuation Yearbook will not be found in the Classic Yearbook. Morningstar will no longer split the 10th decile into subdeciles 10a (and its upper and lower halves, 10w and 10x) and 10b (and its upper and lower halves, 10y and 10z). The loss of these subdeciles will likely be important to practitioners who value smaller firms. Morningstar will no longer calculate industry risk premia (IRPs), which were previously found in Table 3-5 in the SBBI Valuation Yearbook. The IRP is used solely within the context of a Build-Up Model. The loss of the IRPs will likely be important to practitioners who like to use a Build-Up Model in their valuation analysis (alone, or in addition to the Capital Asset Pricing Model, or CAPM). The SBBI Valuation Yearbook included the user-friendly “back page” that listed the risk-free rate, equity risk premium, and the size premia that could be used for estimating the cost of equity capital using both the build-Up Model and the CAPM. The web-based version of this information was the “SBBI Valuation Essentials” module on the CCRC website, which included only the most “essential” data from the Ibbotson SBBI Valuation Yearbook, in pdf format. While the Ibbotson SBBI Valuation Yearbook may be the most familiar product to many practitioners, Morningstar is discontinuing other resources often used by practitioners as well. Table 1 summarizes the valuation data and products that are being discontinued by Morningstar. In recent years, this data had been provided in two broad ways: (i) hardcover books and downloadable pdf reports, and (ii) on the Cost of Capital Resources website at http://CCRC.Morningstar.com (Note: According to Morningstar, the CCRC website will be “switched off” on December 31, 2013). The individual company betas were previously found in the previously discontinued “Ibbotson Beta Book,” but individual company betas (in downloadable pdf format) were available on the CCRC website. These individual company “tear sheets” were useful for helping practitioners form custom peer group beta information for use in their valuation reports. The Ibbotson Cost of Capital Yearbook was the “big green book” that included industry-level statistics and valuation data for approximately 350 individual industries (organized by SIC code). These industry “tear sheets” included industry valuation multiples and betas, cost of equity capital (COE), and weighted average cost of capital (WACC), calculated using various cost of capital estimation methodologies. The industry tear sheets were excellent resources for industry-level cost of capital information for use in valuation reports. These reports also functioned as an excellent way of supporting (and checking) the practitioner’s own custom analysis of the subject company’s industry. Morningstar/Ibbotson’s suite of international cost of capital reports consisted of (i) the International Cost of Capital Report (cost of equity estimates for 170+ countries from the perspective of U.S.-based investors with investments in other countries around the world); (ii) the International Cost of Capital Perspectives Report (cost of equity for 170+ countries from the perspectives of investors based in Australia, Canada, France, Germany, Japan, and the United Kingdom); and (iii) the International Equity Risk Premia Report (historical equity risk premia for 16 countries, including the U.S.). A currently available alternative to the Morningstar/Ibbotson valuation data are the Duff & Phelps Risk Premium Report and online Risk Premium Calculator (available from Business Valuation Resources and ValuSource). Like the SBBI Valuation Yearbook, this publication (and its online companion application) are designed to assist valuation practitioners in estimating the cost of equity capital for subject companies of any size (including very small companies) using both the Build-Up Method and the CAPM. Roger Grabowski (Duff & Phelps) previewed possible 2014 additions and enhancements to the Risk Premium Report and online Risk Premium Calculator on October 14, 2013 at the ASA Advanced Business Valuation Conference in San Antonio. Duff & Phelps is actively exploring expanding its offering of cost of capital data starting with the all-important year-end data that was previously available on the SBBI Valuation Yearbook’s “back page.” Duff & Phelps expects to be making an announcement at the upcoming AICPA Forensic and Valuation Services Conference in Las Vegas. The additional offerings will be timed to provide users of SBBI valuation data with a source of data to complete year-end valuations without interruption. James Harrington is a director at Duff & Phelps, where he provides technical support on client engagements involving cost of capital and business valuation matters, and is a major contributor in the development of Duff & Phelps’ studies, surveys, online content and tools, and internal models for use by the firm’s analysts worldwide. Mr. Harrington has been the editor of the Duff & Phelps Risk Premium Report and developer of the report’s online companion application, the Risk Premium Calculator. Previously, Mr. Harrington was director of business valuation research in Morningstar’s Financial Communications Business and led the group that produced the Ibbotson SBBI Valuation Yearbook, SBBI Classic Yearbook, and Ibbotson Cost of Capital Yearbook. Mr. Harrington holds a bachelor’s degree in marketing from Ohio State University and an MBA in both finance and economics from the University of Illinois at Chicago.